WASHINGTON, D.C. — Faced with insatiable demand for resources for a fleet that is already overworked and under-maintained, the Navy and the Marine Corps need to ease the strain on the services or risk “breaking the force,” according to a new report from theCenter for Strategic and Budgetary Assessment released on Wednesday. “The Navy and the Marine Corps are providing the maximum forward presence — or exceeding the forward presence — they can sustainably provide based on the service’s own readiness models,” co-author of the report Bryan Clark told reporters on Tuesday in a conference call. While authors Clark and Jesse Sloman have uncovered little not already known to naval observers, their study collects hard numbers outlining the Navy and Marine Corps presence problems. 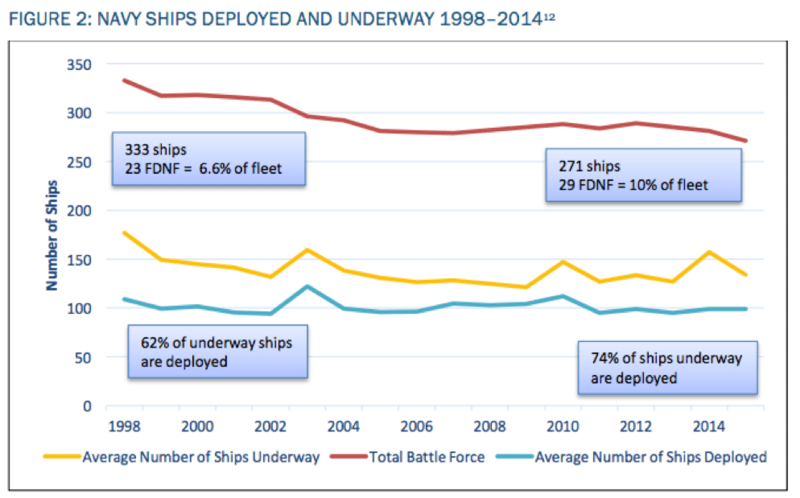 For example, the Navy has maintained a deployed presence of about 100 ships consistently since 1998 despite the fleet falling by 20 percent (to about 271 ships). That level of demand required surface ships and nuclear carriers to forgo maintenance to meet the demand of the regional combatant commanders — in large part to serve requirements for the wars in Iraq and Afghanistan. The Navy, in particular, has attempted for the last several years to claw back from a maintenance deficit from overly extended carrier deployments but has been stymied by sequestration reductions in defense spending due in part to the Budget Control Act of 2011. “The backlog culminated in late 2015 with a Persian Gulf ‘carrier gap’ between the departure of the USS Theodore Roosevelt and the arrival of the USS Harry S. Truman. 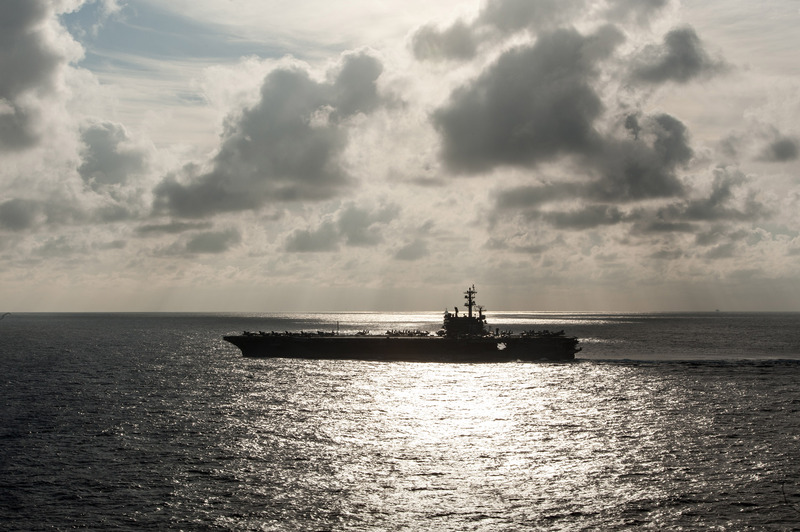 A second carrier gap will occur in the Pacific in 2016 and gaps will reoccur intermittently in both theaters until 2021, when the USS Gerald R. Ford becomes operationally available,” read the report. On Tuesday Clark said the service has found the seven-month maintenance periods it has set aside for the carriers post-deployment wasn’t enough time to get the ships ready and cascaded into additional maintenance backlogs. “Maintenance is really driving the problem. 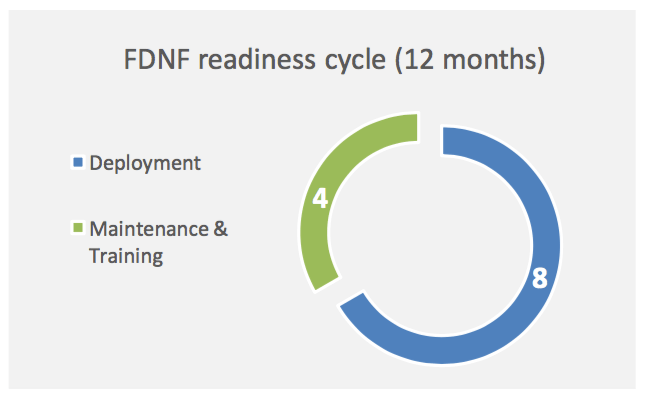 With the carriers we’re finding that [seven months] really isn’t enough time to do the maintenance between deployments,” he said. 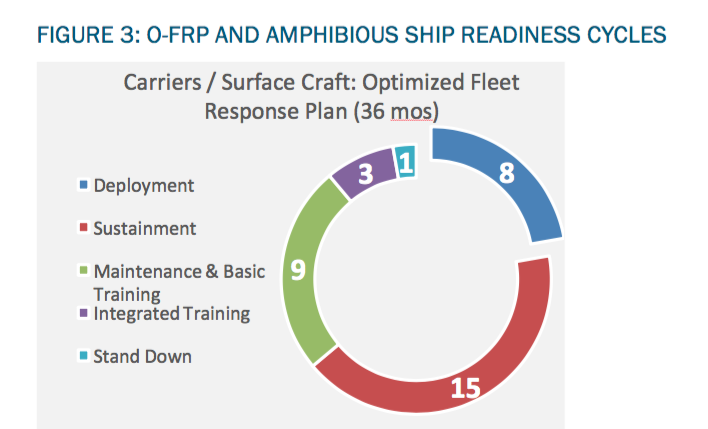 The Navy is currently working to create a more predictable model for carrier strike group — a 36-month maintenance, deployment and readiness cycle called Optimized Fleet Response Plan (OFRP). The Navy has argued that by putting maintenance at the beginning of the cycle, the ships will be able to stay in the yard the for the full scheduled maintenance period — whereas today, a ship might have its deployment extended, which gets it into the yard late and often means work gets skipped to stay on schedule. The recently departed Truman CSG deployment is the first to operate under the plan that promises seven-month deployments, a six-month maintenance cycle and a 15-month readiness period in which the crew and flyers of the CSG would maintain their skills in the event they would need to deploy quickly in an emergency. However, Clark said that the OFRP’s 15-month readiness period is an expensive concept, and the Navy has to cut funds for sustainment periods in similar deployment schemes in the past. “The Navy hasn’t been really paying for [sustainment],” Clark said. The report did offer some suggestions to mitigate the strain of the current status quo of overworked ships, sailors and Marines. “The options that are available to them are either building more ships or a larger force — which may not be fiscally possible. You could expand forward basing. Get more readiness out of each individual ship by increasing OPTEMPO,” Clark said. Notable among the report’s suggestions on how to increase presence without breaking the back of the fleet was to forward deploy a second carrier to the Pacific to ease the burden of the sending ships from the West Coast to patrol the region. 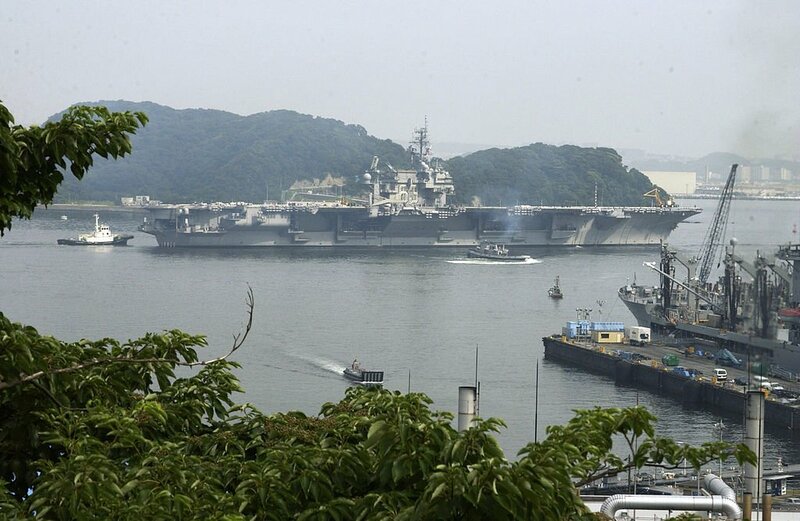 The Navy could consider moving a second carrier to the Pacific to operate in conjunction with the forward deployed USS Ronald Reagan (CVN-76) and sharing berthing space at Yokosuka, Japan. “Japan would be the best option to add a second carrier, if you wanted to do it quickly,” Clark said. While adding an additional carrier forward isn’t a new notion and one the Navy isn’t currently studying, the study has piqued the interest of some in Congress. “The report illuminates the utility of deploying an additional forward-based carrier in the Pacific theater. You really cannot ignore the benefits, both for the Asia-Pacific and for the Middle East and Mediterranean maritime hubs,” a Senate staffer told USNI News. They either do not have to transit to and from their operating areas or have a much shorter transit time than their CONUS-based counterparts. They do not undergo deep maintenance periods such as overhauls. When an overhaul is due, the ship or aircraft is swapped out with a new platform. The crew generally swaps out as well and remains forward with the new ship. They do not conduct extensive retraining between operational periods. Because they operate so often, forward based ship and aircraft crews are often able to maintain a higher level of proficiency than their CONUS-based counterparts. In addition to another forward deployed carrier, the report suggested the Navy find ways to both moderate COCOM demand and offer commanders different options that would stress the force less. The Navy has been exploring the use of so-called alternative force packages designed to augment the capabilities of existing ships and create non-traditional naval options for the COCOMs. For example, the Navy’s surface forces are exploring using more surface action groups for high-end military presence missions instead of a much larger carrier strike group. “Maybe these alternative force packages would have the effect of reducing the demand signal [from the COCOM], maybe these alterative changing it from one size fits all to an a la carte menu,” Clark said. Two USN Carriers in Japan?